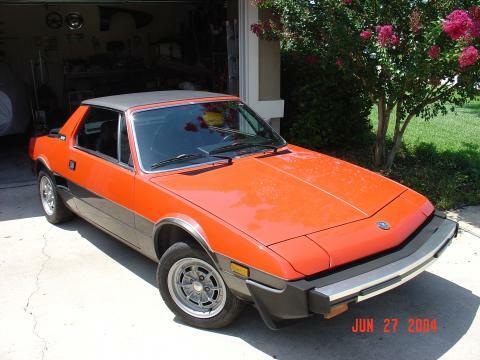 Really its a 1983 Bertone X1/9, but I always think of them as Fiats. I bought this beautiful Orange and Dark Grey Metallic X1/9 from the original Florida owner in 2004, I am the second owner. It has the rare Black leather seats and Leather door panels in very nice condition and original red carpet faded by the Florida sun. It is equipped with working A/C (Air Conditioning), power windows and cruise control. This X includes the original factory Black painted wheels plus a set of Elektron (Magnesium Alloy) Campagnolo wheels that weigh about 8 pounds each (without tires) that I bought from Al Cosentino in the early '90's each fitted with Yokohama A032R tires. The X1/9 was driven to Michigan from Florida and runs beautifully. It has been in dry storage here in Michigan since 2004. The X1/9 also includes all original keys, owners manual, original factory service manuals, original dealers buyers order from 1983 and luggage rack (if you look at the rear decklid you will notice that the luggage rack holes are filled with silicone). I have started the car every year since it was put in storage, and it always starts and operates beautifully, everything works. Smooth shifting gearbox, no odd engine noises. Due to the mileage she blows a little smoke on startup but drives beautifully. Before being put in storage the car received new struts, a new steering rack, new tires, and all of the cooling hoses were replaced. In the summer of 2010 it also received a new Optima Red battery. This is a rare original and clean example of an X1/9, it has only a few minor exterior blemishes, including light damage to the drivers side rear fender as seen in the photos, but otherwise it is an exceptional and completely original X1/9.